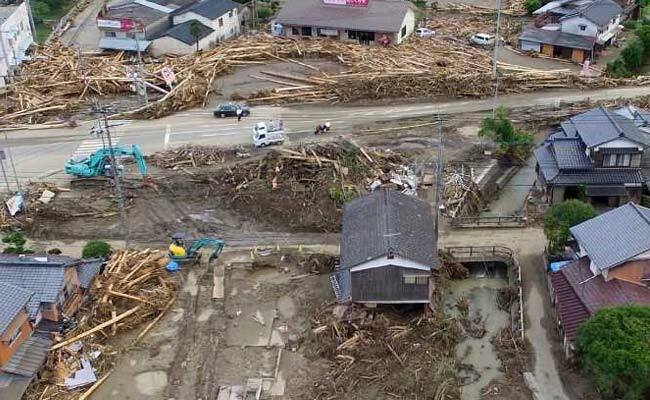 Kyushu: The death toll from torrential rains and flooding that swept through Japan's south has reached 25, the government said Tuesday, as rescue teams battled through thick mud to rescue more than 100 still stranded. Further downpours were predicted to pound Kyushu after swathes of the southwestern island were devastated last week by overflowing rivers -- sweeping away roads, houses and schools and forcing thousands of people into makeshift shelters. But many remain stranded, with emergency services struggling to reach them amid treacherous conditions. Some 150 people were still cut off as of Monday evening in hardest-hit Fukuoka and Oita prefectures, according to local government officials. A total of 25 people have died while at least 25 remain unaccounted for, Chief Cabinet Secretary Yoshihide Suga told reporters Tuesday. Some 12,000 rescuers were making "utmost" efforts to find survivors and clear washed up driftwood hampering the search, Suga said. Prime Minister Shinzo Abe cancelled a visit to Estonia that was originally planned as a last leg of his European tour, which included the G20 summit in Germany, to come back to Tokyo on Tuesday afternoon to deal with the disaster. Abe will visit Fukuoka and Oita prefectures on Wednesday to talk to staff at shelters and local government officials, Suga said. More than 50 centimetres (20 inches) of rain deluged parts of Kyushu over just 12 hours last week, while rains have continued intermittently since. Japan's weather agency on Tuesday warned of continued heavy rains in Kyushu.